SMELLEZE Eco Skunk Spray Odor Eliminator: 50 lb. Powder Gets Foul Stench Out Summary Smelleze® Eco Skunk Spray Smell Removal Powder gets rid of skunk smell without masking with harmful fragrances. 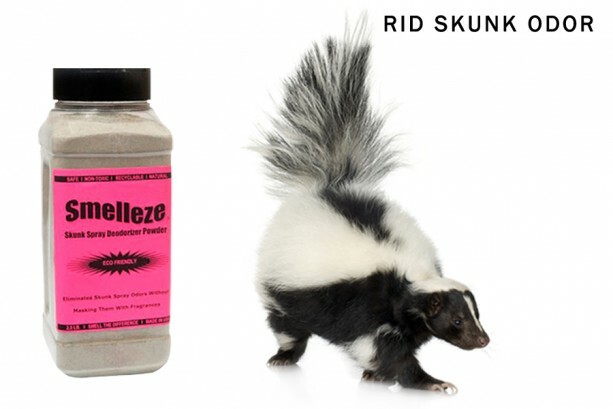 Skunk odor removal is easy with this eco-friendly smell remover that really works! Safe for people, pets & planet. Skunk odor doesn't stand a chance. Features & Benefits • Simply sprinkle & smell the difference • Eliminates skunk spray smell without covering it up • Creates a cleaner, healthier, odor-free environment • Eco-friendly, safe, non-toxic, natural, odorless • Significantly improves indoor air quality • Made in USA Stinky Skunk Spray Smells Solution The spray of a skunk can not only be terribly stinky, but also very irritating to the eyes and mucus membranes. It can also cause temporary blindness if spayed directly in the eyes. The secretions contain multiple chemicals which cause the powerful malodor. One group of chemicals in the skunk spray, the thiols, are responsible for most of the strong smell. Others are acetate derivatives of these thiols. They are responsible for the unpleasant odor that tends to linger and become worse if your pet becomes wet. So how do you get rid of the smelly skunk odor after your pet or yard has been sprayed? 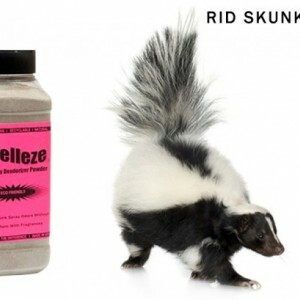 The Smelleze® Skunk Spray Smell Removal Powder was specially developed to absorb, neutralize, and encapsulate the stinky skunk spray odors on contact. 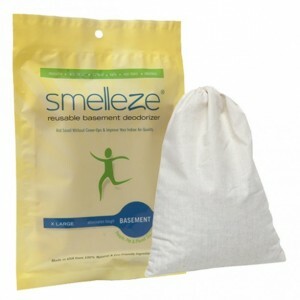 Smelleze® Skunk Odor Removal Powder will truly eliminate offensive skunk odors at the source so you can be close to your pet again and breathe clean air. Please don't bother trying the old tomato juice or vinegar tactic because they are not effective and you will end up with a combined skunk spray and tomato juice/vinegar odor and make the problem worse! 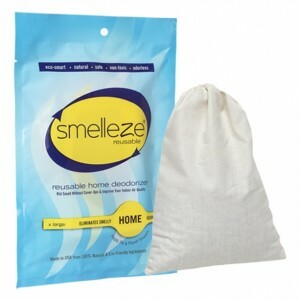 Smelleze® Skunk Smell Remover Powder is non-toxic, safe, recyclable, natural, odorless, non-flammable and non-caustic. Smelleze® Skunk Odor Remover Powder is an ideal environmentally friendly solution for eliminating stinky skunk spray odors without adding pollutants to the air you breathe. It does not contain VOCs, harmful or ozone depleting chemicals and is especially beneficial for those suffering from allergies and chemical sensitivity. No fossil fuels are used in the production of Smelleze® smell eliminator deodorizer media.